The District of Columbia shall select its Statehood Representative, if a Democrat, as one of its two (2) unpledged add-on delegates. 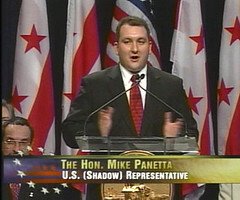 So Mike Panetta is the first known add-on superdelegate to the convention. He has endorsed Obama, and we have added him to our list of superdelegate endorsements. The DC Delegate Selection Plan, which I'm told has been approved by the DNC, does not call for the Statehood Representative to be automatically be given one of the 2 add-on positions. An individual can qualify as a candidate for Unpledged Add-On ... by filing a statement of candidacy with the DC Democratic State Committee, 1341 G Street, NW Suite 720, Washington, DC 20005 no later than 5:00 PM March 7, 2008. If the DC State Party fails to select the Statehood Representative as one of its 2 unpledged add-on delegates, then an implementation challenge can be filed against the State Party for violating the Call. Which means the selection can be challenged before the Rules and Bylaws Committee or the Convention Credentials Committee. Could that happen? The DNC hopes it doesn't get to that point, and has said they "expect the person will indeed be selected". And yes, we've learned that Panetta has applied for an add-on spot. (We haven't been able to determine the names of any other candidates). The DC add-ons are picked on April 3, so Panetta may only be off the superdelegate list for a couple of weeks. But as of now, he's not a superdelegate, so he will be taken off the lists (and Obama will lose 1 superdelegate). This superdelegate complexity is really asinine. Have we learned nothing from 2000 and 2004? "......asinine. Have we learned nothing from 2000 and 2004? " The so-called "elected" delegate system is a big fat fraud as well. I was shocked when I found out how the Texas system works. The whole system is a jumbled mess. The DNC's 2004 Call has the same footnote, and Ray Browne, who was the shadow rep then, was one of the add-ons. I haven't seen whether the 2004 DC Delegate Selection Plan addressed the issue. KC - great info, thanks. M101 - there was a comment on the first thread that I took to imply that it was not a slam dunk, so, honestly, I will stay out of the DC add-on superdelegate prediction business. Well, it seems now Clinton will play the 'Electoral votes' card to win nomination - bringing the General Election concept into the nomination race. But that requires superdelegates to 'adopt' the new rule at first place. Math 101, even those of us in DC who've been talking to some of the people who'll be making the decision don't know what they're going to do. There are a lot of people who want that slot. We'll see April 3. Speaking of DC, I wrote up the current state of the DC convention delegation.